Although I'm joining this conversation late, I must point out to your readers that the peasants suffered more than expropriation and exile. 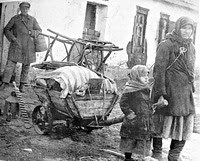 Soviet/Communist policies led to the deaths of millions by starvation, an intentional genocide of the Ukrainian nation (in Ukraine, in the Kuban region of Russia where Ukrainians lived, and in the Ukrainian parts of Kazakhstan). No need to pull punches here. The Soviet state apparatus deliberately starved millions of peasants to death. It was an intentional genocide of the Ukrainian people, even if countries like Russia don't admit it.